Candy making and decorating is now cleaner and easier than ever with this Wilton 1904-1166 6 oz. squeeze bottle! Pour your melted chocolate wafers, caramel sauce, or other liquid candy into this bottle, and easily squeeze out into candy molds! Perfect for making chocolate lollipops, chocolate covered cherries, or any other molded candy, this decorating bottle brings efficiency to your kitchen. It's also great for adding the last decorative drizzle to finish off your tasty treats! They're rather thin but that does add to the flexibility and ease of squeezing. A red cap was included that prevents accidental spills. Overall I'm pleased with the quality, size, and value. This little bottles are perfect for drip cakes. No mess , perfect for sauces, my husband is a bbq sauce fanatic and he absolutely love it. Great little bottles!! Perfect size for smaller projects and purposes. Very flexible, nice sized opening and they hold up well to repeated use and a commercial high-heat dishwasher. Good quality for the price. The bottle is firm, but also easy to squeeze. Works well with flood consistency royal icing as well as melted chocolate. The Wilton 6 oz Mini Decorating Squeeze Bottle is not the best tool to have I used it for a thicker sauce like tahini and pepper sauces and the tiny mouth of the bottle is constantly blocked, so maybe use it for much more liquid and smooth sauces. These bottles are great! You get two bottles in one pack. The quality is great! I used these to simple syrup my cakes. Love them! I love using these mini squeeze bottles by Wilton! They make applying royal icing to cookies a breeze since they fit in the palm of your hand! The Wilton mini decorating squeeze bottle is amazing. We use it for cake drips and it’s the perfect size as well as has the perfect pour. These are good little squeeze bottles for drip cakes or candies. Great for making designs on chocolate covered berries. They are a bit difficult to clean. I like the small size.. it makes them easy to hold and helps keep a steady hand. We just recently bought these mini decorating squeeze bottles, love the quality and how the tip is so precise for those extra delicate jobs, super recommended. This product has changed! I have been using these bottles in my cookie decorating business for years with no problems. I ordered a bunch of new ones recently, and the tops pop off during use. This is not ok, seeing as how they are specifically intended for decorating use! I thought it was a fluke, and that one bottle was defective, however 3 different bottles have done the same thing. When the top comes off, icing pours out of the bottle quickly, thus ruining the cookie I am working on and those around it as icing spreads over the tray. I finally decided to look more closely and compare these to my old Wilton bottles, and in fact the threading area has been shortened. There are no longer enough threads when screwing the top on, to keep it in place under pressure, rendering these bottles practically useless for their intended purpose. Very disappointed in this change! Thank you for your review, Brett! We are sorry you did not prefer this product, try this Tablecraft 1104 4 oz. Chef Squeeze Bottle instead! Very small bottle. It works, but I've found that the bigger bottles are more versatile and get the job done just as well. The tip covers are really nice. These bottles by Wilton are the same as the other company's bottles but they want you to use them for their Candy Melt products. Don't do it. Use a piping bag. The candy sets too quickly and you cannot put these bottles in the microwave! I use these bottles for sauces and garnishes that stay fluid for a while, if not indefinitely. I'm using this for hardware oil and its perfect. it does not leak and the red cover hols well onto the tip of the bottle. I love having these bottles on hand while I’m baking or decorating cookies. Let some of the previous reviews have said, the tops can tend to pop off if you’re squeezing too hard since it bends at the threaded top connecting the cap. Otherwise this is a great product for drip cakes, candy melts, flooding consistency royal Icing. When I started decorating royal icing cookies I used icing bags for all my icing. Then I realized that bottles are great for flooding. I LOVE using them for my flooding, here's why: -Size: 6 ounces is a good size for flooding icing. I usually don't have to refill it if I'm doing a few colors. I did teddy bears today and used a lot of brown and had to refill. I ordered a 12 ounce one for those times I'm using a lot of one color. -Tip: The tip is roughly the equivalent of a Wilton 2 or 3. It floods pretty quickly! We like this Wilton 1904-1166 6 oz. Squeeze Bottle - 2/Pack, the size is perfect to simple syrup and different sauces. The material is really good. I used this product to make the chocolate ganache drip on a cake. It worked perfectly for that, thought it was extremely difficult to clean due to the tip being smaller. If you plan to use your bottle for something similar, I highly recommend investing in a small wire brush. I use these bottles for decorating cookies with royal icing and they work very well. East to fill and clean. They are also a great price. Easy to squeeze. In addition to caramels and simple syrup I use these squeeze bottles for my oils. I wrap a paper towel with a rubber band around the bottle to catch drips. These are not what I was expecting and not recommended for dressing take-out food with condiments. The bottles are so soft that the top blows off if it is squeezed too hard. These bottles are so great, I love to use them for my different colored royal icing when I am making cookies, it is easier to use a bottle than to use a piping bag! These squeeze bottles have been great for decorating, plating and storing various sauces / liquids. However, the top and red cone tip are fairly difficult to clean fully. Also, while dealing with a slightly thicker sauce the cap dislodged while I was plating and exploded all over me, the plate and the floor. Best advice is to make sure you clean them thoroughly and when trying to dispense thicker liquids be careful about how much pressure you put on the bottle. These worked perfectly for my baking needs. However, just know they are not microwave safe. Other than that, they are great! I still would recommend them. This bottle is really good for putting any kind of ganache on a cake. I love that it has a red cap to cover the bottle tip to keep the ganache fresh. I have been using it for few months and it works like a charm. I really recommend it. I have gotten few on another site before I stick with this one. Wilton is known for good quality at a good price point, and these 6oz mini squeeze bottles are no exception. Price for a 2-pack is a steal, opening is pre-cut, so be aware of that. Nice secure cap will keep you sauces from drying out. These decorating squeeze bottles are perfect for the bakery, plating different dishes, and general kitchen use. The red tips are easily lost, but overall I would recommend buying these. I tried using these to drizzle butterscotch over a cheesecake, but it doesn't hold up to squeezing thicker (but still saucy) liquids through it-- there isn't enough threading to keep the lid on. When tightening it, if you do what you think will be one final twist, it goes back to being completely loosened. Bummer, but still functional for thinner sauces and syrups. These are so handy to have on hand for a variety of uses! In addition to being great for decorating food, you can also use these for art projects. The red cone tip keeps it sealed so product does not easily dry out (though storing something in this long term would not work) and the tip is fine enough it makes small decorating tasks easy. I really like these bottles I use them for chocolate ganache. They hold a good amount of ganache or royal icing. You can also use to decorate cookies. Will order again. I use these to decorate a cake with a chocolate ganache drip. It helps to also use a funnel to help pour the liquid into the squeeze bottle. The red tip is great but wish it was connected to the bottle so I don’t have to always search for it. These decorating bottles are great for icing cookies or doing detail frosting work. They come with a very small hole in the tip, and a tiny red lid to seal it when not in use. If you want a larger opening, just snip off a little of the tip! These work great, but cleaning them out can be a bit of a pain. Amazing product easy to use easy to Wash you can use on strawberries or just a drizzle on your favorite cookie. I love to let my kids use it it controls the mess a lot easier. Great bottle with a perfect size, not to small not too big this bottle is perfect for decorating plates with both cold and hot sauces. These are quite small and when we try to dispense the contents, the cap actually falls off a lot. Theyre a nice size but the function is not there. These squeeze bottles are great, they are flexible enough to be easy to use, but sturdy enough that they won't collapse under heat from the liquid in them. These Mini Decorating Squeeze bottles with Red Cone tips are great to fill with all kinds of liquids- ketchup, olive oil, vegetable oil, even water. You will find many uses for these great bottles. I use this for multiple sauces. I have misplaced the red tip on occasion, but it is a great option to be able to cover it in between uses. Squeeze bottles are a tool we use frequently during prep and service at our pop up dinner events. This bottle is great for salad dressings and desserts. It has a capacity of 6oz and a small tip to make precision decorating easier. We typically use masking tape to label the bottles so our team will know what is inside. Not too much to say, except they are a good size and work well. The price is certainly right, as they're cheap enough to keep a bunch of them around and already filled with whatever you need. They caps are handy, though they can be easy to lose as they're not attached. 6oz aren't that 'mini', but they're a good size for drizzling melted chocolate or frosting or oil onto popcorn. The hole in the nozzle is the right size for getting thin, attractive drizzles without being too small or too large. I appreciate that they come with caps. We use these for cookie decorating. They fit perfectly in your hand and usually are the right size for the small orders of cookies we get from time to time. It has def made my job easier with the cookie orders. This is perfect for decorating cookies- makes them look so much nicer with cleaner designs and lines. They are not too big, which is good for making small batches. This squeeze bottle holds 6 ounces of liquid. it has a fine tip which is great for cake decorating or small plate decorations. the red cap covers the hole preventing it from drying out. This bottle is perfect for a variety of activities. Perfect in baking as well as cooking. The red tip protects the contents from air and dust as well! This dual pack of mini squeeze bottles are perfect for doing drip cakes! I especially like that the bottles have a top to close the bottle- perfect to use for another time. These bottles are great. Easy to squeeze and dispense. They are very nice to have for my buttery popcorn topping and olive oil. I am very happy with my purchase. Great bottles. I use them for small amounts of flood consistency royal icing. The tip did split in half on me, which is why i deducted one star from my rating. Perfect sized bottles that come in a pack of two. We filled these upon arrival with vinegar and oil and they have held up well to use. For the price, you cant go wrong and they also come with a red tip to seal after use. I purchased these as I needed a smaller condiment bottle as we have a number of signature sauces. They have worked out as an ideal space saver in our prep table! Quality is better than expected for the price too. These bittles were used for drizzling chocolate over my infamous brownies. They worked perfectly! No globs of chocolate, just smooth, neat lines. We also use them for strawberries. The wilton squeeze bottles are a decorators best friend. Our team members use these bottles for caramel, chocolate, and glaze. They save time and have very little clean up. I really love this Wilton 1904-1166 6 oz. Mini Decorating Squeeze Bottle with Red Cone Tip - 2/Pack. It's perfect to drizzle your desserts or decorate your plate prior to plating. i also like using it to soak my cakes with simple syrup. It's perfect. I wish that the tops were bigger to put the chocolate into but it works all right you have to make sure that you keep it in warm water while you're not using it or the chocolate will get hard and it is really difficult to get any chunks out . I love this mini decorating squeeze bottle. I was perfect for drizzling lemon icing onto my homemade sugar lemon cookies. I will defiantly order some more. these bottle are excellent for thin line designs or dots; they also can be used with different things such as icing or melting chocolate ! I love the verssatility and I get them for a great price! We appreciate your review, Greg! If you are looking for a different product that will better suit your needs, please contact our Customer Solutions team. These are awesome for decorating cakes, cupcakes, and cookies. It's gives a very thin line when needed and you are able to decorate very easily. These bottles are great! Good size for sauces to decorate plates. I would like to see a little better screw top because sometimes they slip. Great product for the price! The Wilton 6 oz. Mini Decorating Squeeze Bottles exceeded my expections. Great price and Quality! I would highly recommend. 5 Stars! Would definitely purchase again. Purchased for condiments. This is a good brand for things related to pastry and compared to certain fancy cooking stores, prices are crazy cheap on Webstaurant Store. I like getting these bottles with the little caps as they don't require plastic wrap or anything to store. Super useful. The bottle is made of a really flexible and thin plastic. I love the red cap that it comes with but i would be afraid to put it in a microwave for it seems like it would melt. These squeeze bottles are perfect for putting larger amounts of sauce or liquid in for use. I buy hot sauce by the half gallon so these make life much easier. What great little bottles. I use them for my finishing oils on my plates. The small size allows for precise dotting and they are easy to clean. Would buy again!! It is a mini bottle is perfect for use in the decoration of dishes. It is very functional and durable. Definitely a must if you are in the business of desserts. Compact bottle that works just as described. What sets this apart from most other bottles is its inclusion of a tip. For some reason this is hard to find on other such squeeze bottles, but to me is critical to keeping the bottle sealed while in the fridge. These smaller bottles are perfect for thin royal icing for cut out Cooke decorating. Be sure to keep the small caps for extra food safety. I use squeeze bottles for my flood royal icing when I decorated cookies. These bottles are some of my favorite because the wide mouth makes them easy to fill, they are not hard to squeeze and cleaning is relatively easy. Wilton is a great brand for cake/cookie decorating supplies. Love filling the Wilton 6 oz. Mini Decorating Squeeze Bottle with icing to flood sugar cookies. These decorating bottles also work well with melted chocolate (allowed to cool slightly) to fill small molds. This is super handy. Its smaller than the typical squeeze bottles to use for decorating cakes. I use it for condensed milk to add to my coffee or syrups to squeeze onto dessert. it is a bit difficult to wash with a sponge, I would suggest a brush since its hard to reach with your hands. These bottles work well for my application. I'm using them to squeeze olive oil for pizza prep before it goes in the oven. The holes do come pre-cut, but the hole size is adequate. I chose these over the less expensive six pack because I wanted caps. Love using these to drizzle Chocolate Ganache on my cakes. I can just put in microwave to melt Chocolate a bit then just drizzle and I'm done.. Makes the job much more easier. The bottles work great for cookie flooding. They are not very small for being called mini, but the 6 oz. size holds about enough icing to be able to flood about a dozen medium size cookies without refilling it. I really like these squeeze bottles. Very handy in making the chocolate or caramel drizzle for my cakes and cupcakes. I've also used them for fillings on cupcakes. These squeeze bottles are pretty easy to use and maintain the flow on. Best for slightly runny sauces or syrups for quick drizzling in cross patterns. This is a great squeeze bottle. It is exactly as described. I use it for topping off crepes. I would definitely recommend this product again. great size with a great price -- very versatile and they hold up well in the dishwasher. The caps are a nice touch to keep your ingredients fresh. Will definitely buy again! I love this one, very versatile and works with my cookie flooding. I used it too for my dessert plating in the Culinary Arts classes. I purchased the 6 oz. Wilton 1904-1166 mini decorating squeeze bottle with the red cone tip. These handy botttles are great for precise application of sauces. These bottles are cheap enough that I think it's worth buying them, but in all honesty, as far as decorating is concerned they don't do anything that a piping bag can't do. You'd be better off getting small piping tips and stick to using bottles like these for sauces and dressings. These 6oz squeeze bottles are just what I needed. I buy my vanilla in 1 gallon containers. Just fill one of these up and I've got precision control. Also great for filling my tea cookies with jam or honey! Simple, yet very effective. You never know when you need something like this for a dessert. I mostly use it for chocolate and royal icing. Mini squeeze bottles are not that small and I find that they work better than the larger ones. The prize is a bargain compared to many other stores. This is a simple product that can make doing some task more efficient and precise. We use this to drizzle different toppings onto our dishes such as, truffle oil and cranberry gastrique. We love it ! I use these for cooking decorating with royal icing. They are inexpensive and have a cap to keep the icing from drying out. I mostly only use them for flooding as the tip is a little too large for detail work. I've used them in the past for candy melts as they are sold by Wilton for that purpose also, but I wouldn't recommend them for that. They are not microwave safe. I use these squeeze bottles primarily to drizzle simple syrups onto my cake layers to keep them moist and to drizzle syrups, purées, and sauces. They do the job just fine! It's very soft plastic, so be sure not to add hot liquids to the bottle. This Squeeze bottle with red Tip is a good product and the quality of the material is also good. the only thing negative is that miss the meter. Theses little decorating bottles are something we haven't had in the past because the prices at the local store seemed very high for such a small, simple tool. These Wilton 6 oz. Mini Decorating Squeeze Bottles are priced very reasonably, so we figured why not? Fun and useful for numerous things. I bought these for mixing/dispensing oils and they work fantastically. Can't say how they work for their intended purpose of cake decor, but for infused oils they're awesome! I have a few Wilton mini squeeze bottles that I use for cookie decorating. I love that they are clear so you can see what's in them. It keeps my work space neat. They are washable and reusable. This is a excellent price for a small squeeze bottle that works well for plating various sauces to get that perfect presentation for your deserts or main dishes. These are great! They are perfect for storing sauces as well as honey and other syrups. They can be kept in hot water without melting. These have worked great so far. Wish they made small ones that had a bottom screw cap to clean easier. We ended up cutting the tips which were too small. These bottles are great when doing fill on a large number of decorated cookies. The price cannot be beat! I find these bottles to be a bit flimsier than the 4 oz bottles sold by webstaurant. The thing I did not notice when ordering is that these bottles have a wide mouth opening, which does not allow me to use my standard tips with a coupler the way I can with the smaller bottles. The included tip is probably fine for filling, so I will use them only for that purpose. Fancy artistic plating at home! If you are a home cook like me and you buy these, you can impress your dinner guests with the designs you can make with sauces. The price is cheap enough that you can play around with these and experiment. These are nice for the price! I am sure there are better and more expensive alternatives out there but for me these were the right choice! Great for your little helpers to use. Plus nice and easy clean up after! This is a great product the holes are just the perfect size for a lot of my decorating requirements. The caps on top make storage even easier. These bottles are easy to use when decorating cookies or candies. We have used them to make molded candies using the candy melts. They cant be microwaved but we keep them in a warm water bath in the crock pot which seems to keep them just right with the consistency. These have a nice fine tip and are great for writing and intricate detail with less-viscous icings or fruit jams. The cap keeps the product fresher longer and the size is great because you don't end up throwing out a ton of product if you just use it for one project. I love these for homemade syrups, caramel and drizzling melted chocolate over goodies! They are very well made, and can go from fridge to microwave without problem. Will be buying more!! We have never had much luck using the Wilton squeeze bottles for chocolate detailing, but they are perfect for doing finishing work with caramel and chocolate sauces. They hold an adequate amount that more than accommodates what we need for the final drizzle on our cupcakes and are easy enough to clean. They do not hold up for more than a couple of months of regular use, though, and begin to crack along the seams. But for the price, who cares? These bottles are so useful for decorating; I've used them for icing, syrups, and glazes in baking and for sauces to garnish appetizers or entrees. The price is good and I am buying a few more to have on hand. Excellent little candy syrup squeeze bottles. They are built of tough material and the caps stay on tight. They are just the right size for syrups. I like to use this mini squeeze bottle for small decorations on plated desserts. I use it for squirting caramel or other sauces onto the plate. Great for little details. Works great for decorating baked goods. I also use mine for oils and other blends. A great use when decorating treats with homemade berry syrups. Versatile item for anyone to keep in their kitchen! I use it for a variety of things, including filling chocolate molds and drizzling glazes. Easy to handle. I love that they include the tip so that you can seal it if necessary. The Wilton 6 oz. mini decorating squeeze bottles are great for decorating purposes for cakes and cookies. They are even better for your sauces, especially when plating and needing control of quantity and placement of sauce. We use this for almost anything including for garnish sauces like caramel and chocolate. Very squeezable bottles. And the price is great. Another winner from webrestaurant.com. I have found a million uses for these little bottles. easy to fill and just right opening for dispensing garnishes and designs to plates or foods. 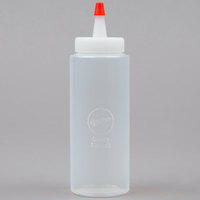 These squeeze bottles from Wilton work well for all types of decorating applications. They are a lot easier to maneuver than the lager bottles. I would defiantly buy these again from Webstaurant.